Stopped by GN today for the first time and got Lamb Biryani, Aloo Palak, a Sheek Kabab Paratha sandwich, and a side of Nan for takeout. The ride home was a quick one as the smells coming from the bag were wonderful and I could hardly contain myself. Unfortunately there was no need for the rush and the smells were just playing tricks on me because the food was not very good. The Sheek Kabab sandwich was the first thing I tore into and I immediately realized something was wrong. The "kabab" was more like a meat mouse pate, far from the texture (it was mushy) and shape (it possessed no shape actually) I was expecting from a kabab and what the picture on the wall led me to believe I would get. The seasoning on it was good and I liked the paratha it was wrapped in, but the texture was really off-putting and there wasn't any crunchy element to offset it. The Lamb Biryani was another letdown. The rice was good seasoned rice, but the the lamb itself was very dry, tough, and mostly inedible unless you like that sorta thing. Also, in my instance, takeout meant no side of yogurt and raw onion (also was missing in the kabab sandwich) that you get when eating in. This is a shame, because I think the yogurt would have added a refreshing element to the heavy seasoning/spices, and the raw onion would have provided a nice textural contrast. The Aloo Palak was the only saving grace as I thought it was nicely done and had a perfect amount of spice/heat level which woke up your taste buds without being overpowering. The Nan was alright, but I think I'm more of a paratha-guy. While I can't claim to have much experience with Indian and Pakistani food, I'm quite sure the things I found off-putting about my meal would be valid regardless of the cuisine. I had hopes of GN being a place that would provide me with solid Indian/Pakistani food at great prices, but this first encounter just didn't deliver. On the plus side, there are plenty of leftovers to potentially be consumed in about 12 hours when I won't care nearly as much. So, finally got to check out GN. Some of the prices are quite impressive, and my initial reaction to the food I got was that if you know what to get here, you will be well rewarded, but you gotta know what to get. Big menu, bunch of stuff. The current menu has a list of "Winter Specials" on the back. They range from 2.99 to 3.99. 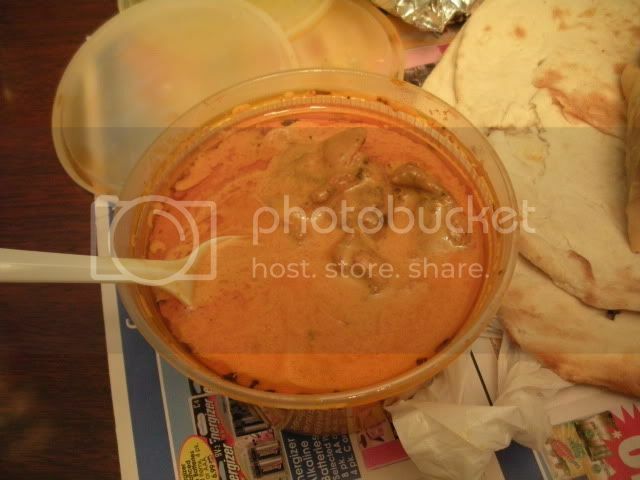 Examples: nihari, chicken nihari, Goat Paya, chakna, and some kind of kidney dish, can't remember. I grabbed a take out menu a few nights ago so I could call ahead and do a quick pickup. Since the prices are low, I ordered a bunch of stuff to get a lot of tastes. Clockwise from top left: Butter Chicken; aloo samosa sitting on naan; paratha; Gyros boti in paratha; boneless chicken biryani; aloo palak; beef nihari. The Aloo samosa were fine. I have bought whatever brand they use in the freezer section of an Indian Market. I can't remember the brand name, but, these are not housemade. They are fine. Naan, paratha - again, fine - GREAT price. At 4.99, this was an "always get this here" dish, imo. This will be my standard for rice at G. Nawaz each time I go. Sad to say, I was not impressed at all by this. In fact, I thought it was pretty flippin bad. If it had standard gyros meat in it, then @ 2.50, it would have been a steal. But, as it were, it was filled with square chunks of that fake, ultra processed, gyros product. I'm not sure if anyone is familiar with this stuff. I know of two places that use it: Cooker's in Deerfield, and Novi's Beef in Berwyn. It's, well, it's foamy. Almost has the texture of deep organ meat, like liver. It's like if Subway started to sell gyros, this would be the "meat" that they'd use. Or if there were such a thing as "deli gyros," like some people term those fake, foamy jiggly loves of pressed turkey broth and gelatin as "deli turkey." I'll just leave it at I was not a fan, and get on with my life. Nobody wants to hear my thoughts on fake meats anymore. Too salty for me. I'd get it again. If the salt content is the same on my next try, I'll write it off. Definite potential, but just plain out too salty. as others have stated, this was kinda blah. boring. Definitely have had better. No complexity or richness at all. I'll try it once more, but if it's the same next time, I'll never get it here again. So, I've had nihari once before, and I kinda thought it was a "not for me" kinda thing. As a 2.99 winter special at GN, I figured what the heck, and gave it another shot. I'm pretty sure I now have a budding new obsession. Even if this GN version would probably be called "bush league" by nihari enthusiasts, I think I now understand how this stuff can be good. I now feel this urge to go try Sabri Nehari's version poste haste to see what all the fuss is about, but GN's version brought it on. This stuff was delectable. My mouth is watering just thinking about it right now, and I'm not even kidding. Juicy, tender, BEEFY chunks of whatever stewing meat they used, in that super spicy, and wildly fragrant sauce. This stuff definitely "tasted like more." 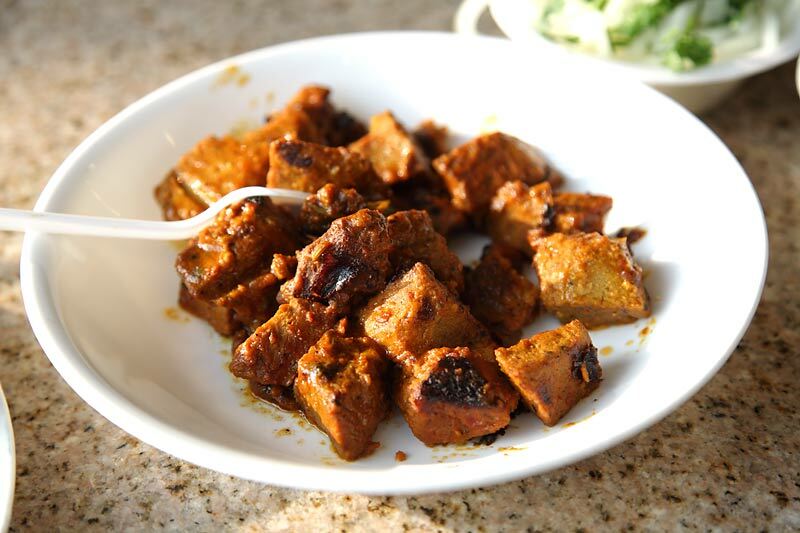 The fragrance of the sauce hits you like a freight train, then the mouth watering starts in after a few chews of the beef elicits that tangy sensation, and then the fiery heat sets in, and it all gets rounded out once again by that heavy beef flavor you can only get with those stew cuts. THIS is what the fuss is all about. I'm officially aboard the nihari train. Next stop, Sabri. All in all, after my first visit, I'm pretty sure if you know what to get at GN, you'll have a great meal at a standout price. Went back to GN today and got the beef nihari with some paratha. As you can tell from seebee's pic above, it isn't much to look at, as it was a big chunk of braised beef swimming in a brown gravy and reddish braising liquid combo. That being said, it smelled and tasted better than it looked...the beef was nice and tender and the sauce had a nice spicy, but not overpowering flavor. Wrapped in paratha with raw onions and yogurt sauce made for some good eats. I'm gonna get back there this week to try some more of their stuff, but that boneless chicken biryani and 2.99 nihari are definitely standouts, imo. The chili chicken at Ghareeb Nawaz is awesome. It's not as dry as other versions, but it is very aggressively spiced and savory. Great stuff with some paratha and raita. Habibi wrote: The chili chicken at Ghareeb Nawaz is awesome. It's not as dry as other versions, but it is very aggressively spiced and savory. Great stuff with some paratha and raita. I should be there Monday or Tuesday with any luck. Agreed, of all their biryani, it's the best. It's not Biryani, it's Chili Chizicken. They offer both a chili chicken, and a chili chicken rice. They also offer a "green" chili chicken, and a "green" chili chicken rice. seebee wrote: They offer both a chili chicken, and a chili chicken rice. Yeah, I'm talking about the chili chicken rice, which if memory serves me correct, is also boneless. 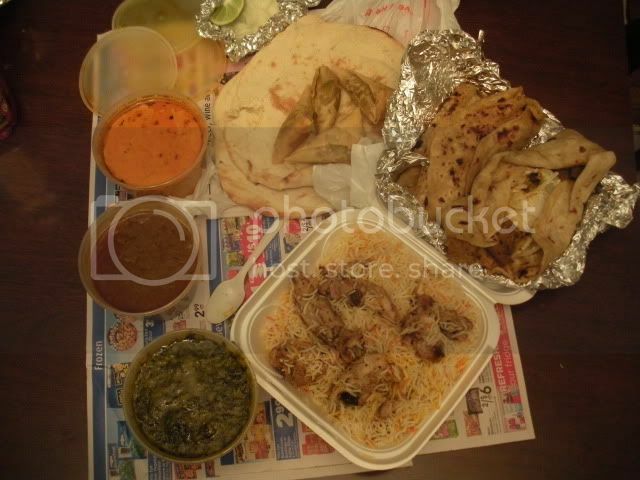 I've tried the chicken biryani at Ghareeb Nawaz. It just doesn't compare to the chicken biryani at Delhi Darbar, which is on California just north of Devon. I have been fascinated by this dish for a long time, it being created for royalty and all. And my love of chicken and/or rice. I've tried it at some of the most highly recommended places. But I've been seriously disappointed with pallid rice that had just a vague memory of spices and a few scraps of chicken. Then I visited Delhi Darbar with a friend, and I was hooked. Their chicken is coated with a spice rub before being cooked with the rice, which has its own blend of seasonings, including saffron. It's definitely hot and spicy. But, wow. In fact, "wow" to everything I've tried there. And it's really cheap too! It's a hole-in-the-wall type of "joynt", so don't expect a lot of ambiance. Make the trip, you won't be disappointed. Delhi Darbar has moved recently to 3010 Devon. That's near Devon and Sacramento, a few blocks west of its old location. Had goat paya from GN last night after a bout of drinking and it really hit the spot. 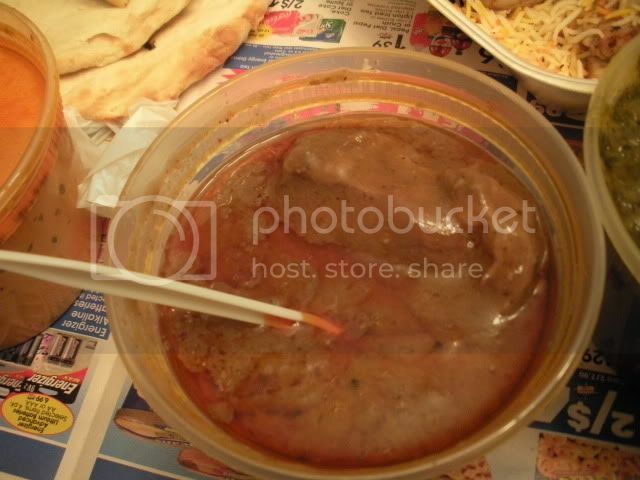 Paya is basically trotters in a thick gravy cooked into oblivion until the gravy is infused with fat and cartilege. As far as I can tell its not meant so much for eating the solids, though some of the stewed, rendered fat is delicious, as it is meant for sopping up the gravy with good bread. Probably not something you should eat a whole lot of, but absolutely delicious. On another note, has anyone else noticed that GN's nan as well as others' tastes oddly like bisquick pancakes? Im oddly disturbed by this. What is going on here? Since last summer Ghareeb Nawaz has undergone some pretty big changes. Sure, some of it's old charm is gone, but overall I cannot complain. 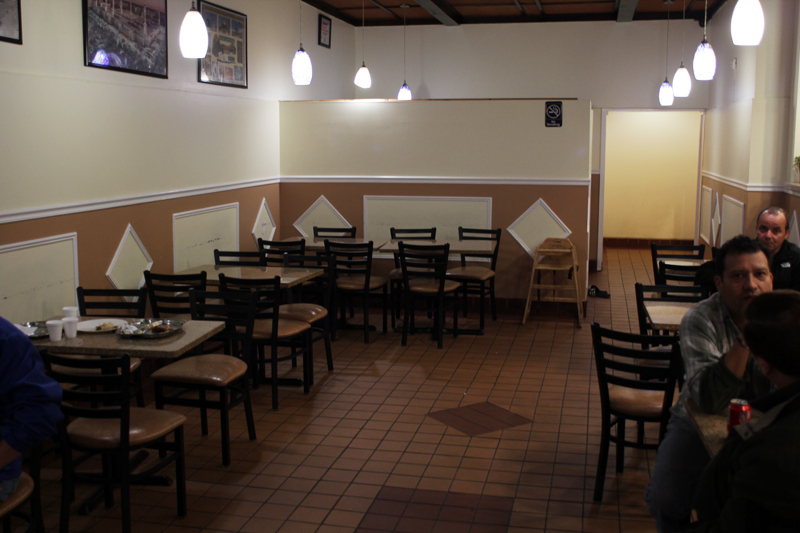 It's much more dine-in friendly, meaning it's cleaner and has better seating. The food has remained the same, perhaps with a few improvements. I have taken some pictures of the remodel as well a few of my favorite dishes. Rear dining area, typically much busier than this, i was in right before the rush. The view from the second dining area. Baghare-baigan. A peanuty tamarindy curry with eggplant. Oily, tart and no capsicum spiciness. Heavy enough that you probably wouldn't be able to finish it in one sitting, yet somehow it seems healthy despite it being oily. 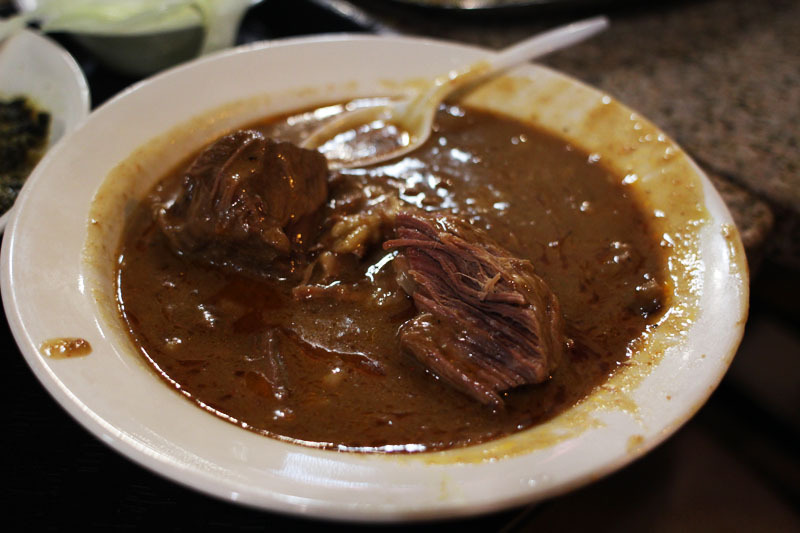 Beef Nihari - the national dish of Pakistan. Tender, moist and lean (I think brisket) soaking in a savory gravy with a hint of anise, if i'm not mistaken. Reminds me of some of the beef stews I've had in Hong Kong. Subtle spice, richly savory. Hidden beneath the gravy lies the beauty of this dish, the fat and tendony bits. 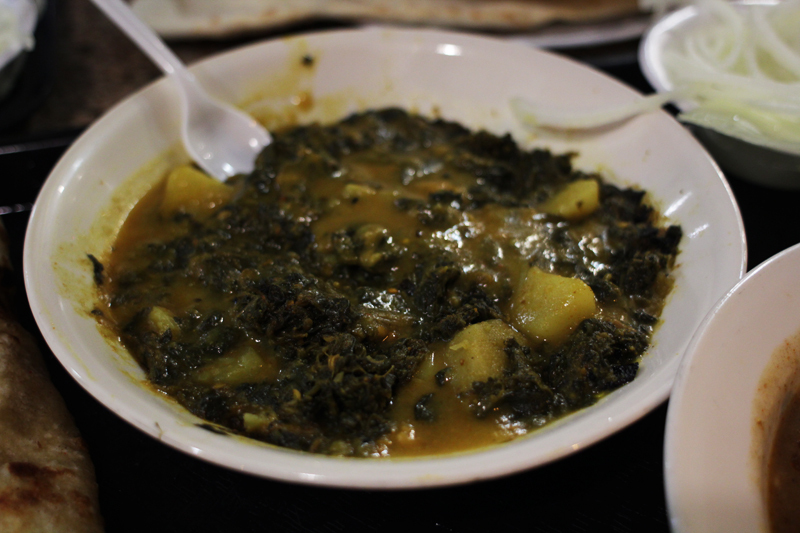 Aaloo Palak - Spinach and potatoes. No complaints here. A vegetarian friend ordered this one; I wouldn't have since it's too Similar to the Palak Gosht (see below) but without the meat. 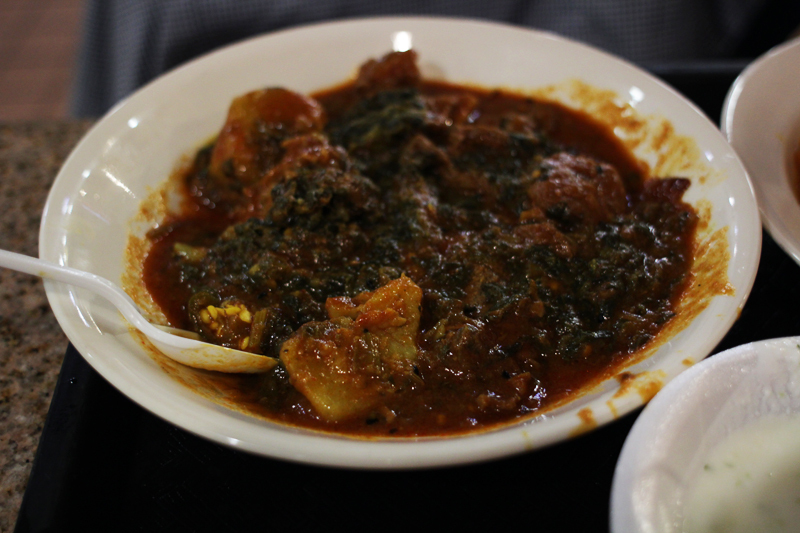 Palak Gosht - Spinach and goat. One of my favorite dishes, at one of my favorite places. 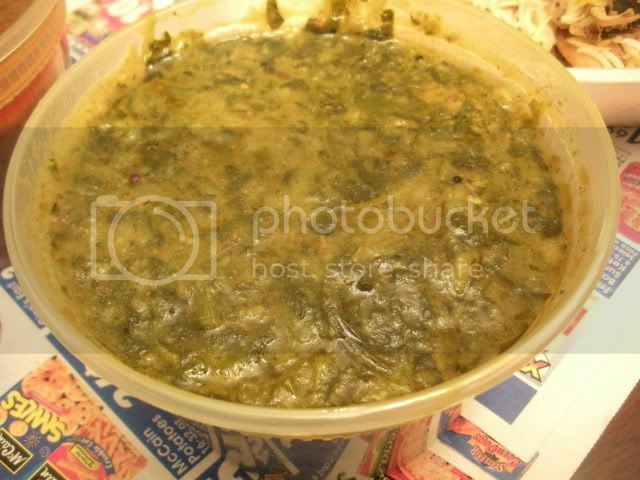 This is the dish which Ghareeb prepares least consistently. Sometimes there are no potatoes.. Sometimes there are far too many. Other times its' simply goat slathered in the remnants of the palak sauce. I'm pretty sure the correlation relates to to time of day and how busy that day happened to be. The palak dishes often run out quickly on busy days, so I'm pretty sure they will actually give you more goat when when the palak is low. Not sure how the system works, or at which point the palak is mixed in during cooking, perhaps this has something to do with the inconsistency. As you see from the picture it was very red today and had chunks of hot peppers. High on the spice level and delicious. Other days it's as green as the Aaloo palak and relatively mild. When it comes down to it, I've never complained. Most of the time i actually take 2 of these home just to have some leftovers for a week. 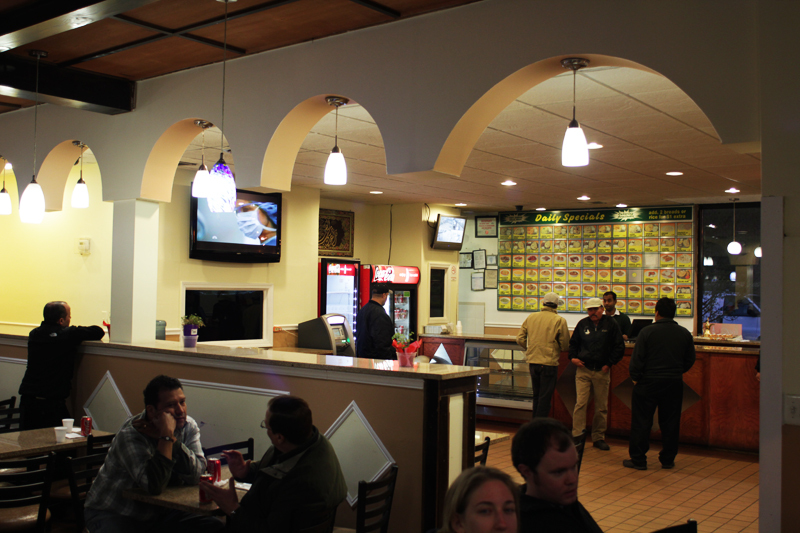 After many changes of hours, Ghareeb is now (again) open 24 hours. Certainly one of my favorite places which is still open 24 hours. I followed Habibi's and laikom's advice and grabbed a quick dinner at GN last night. Chili chicken paratha and palak gosht were each pretty terrific. The spicy and moist chili chicken, wrapped up with a bit of onion and yogurt was top notch fast food. Not sure if the gosht was goat or lamb, but it was richly spicy without being too hot, and full of bony, fatty, delicious meat. As other have noted, the prices at this place are a joke. I will head back soon to try some other things. laikom wrote: It's much more dine-in friendly, meaning it's cleaner and has better seating. The food has remained the same, perhaps with a few improvements. Cleaner and Much better seating, I hated the fourth-hand fixed elementary school seating. From my light lunch, halwa puri and beef samosa, Ghareeb Nawaz seems the same on the plate. Joint was jumping, almost every table occupied and takeout biz brisk. Now if only La Unica would ditch the uncomfortable fixed seating I'd be a happy camper. RAB wrote: Chili chicken paratha and palak gosht were each pretty terrific. The spicy and moist chili chicken, wrapped up with a bit of onion and yogurt was top notch fast food. Chili chicken paratha for $2.99 is up high on flavor punch to value, spicy filling delicious. Goat/lamb byriani, light flavorful rice, chunks o lamb, though I found, surprisingly, I wasn't in the mood for rich slightly fatty lamb after after slinging BBQ all night. Ghareeb Nawaz is, was and remains a favorite. Ghareeb Nawaz, count me a fan. I like restaurants that post their menus outside so it stands to reason that I should love Ghareeb Nawaz, where a billboard-sized menu occupies a large portion of the outer east wall. The inside menu (also online) offers about twice as many choices. In the last couple weeks I tried a few dishes that haven't been discussed in this thread so thought it might be worth mentioning them. Over in Shopping & Cooking, Tatterdemalion introduced us to hunter beef, the Pakistani version of corned beef. 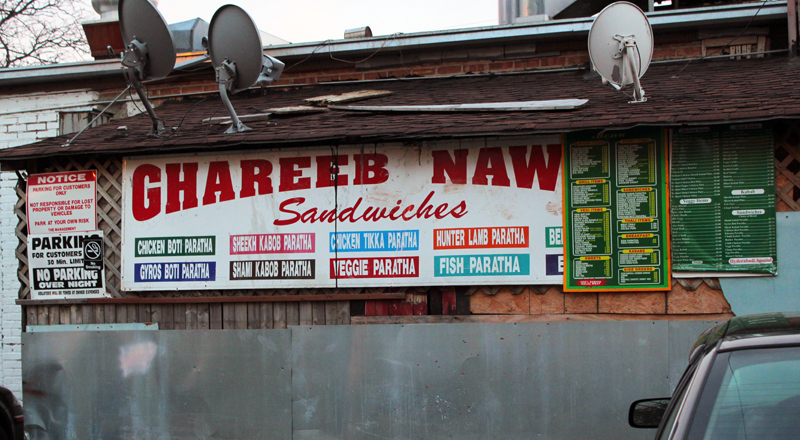 For $2.99 Ghareeb Nawaz serves a mound of shredded meat and a first-rate paratha with some yogurt and raw onion. A cheap and pleasant introduction to Pakistan's national salted meat. It's a good idea to skip their unexciting naan in favor of other breads or rice. Kapsa makes a good argument in favor of rice. 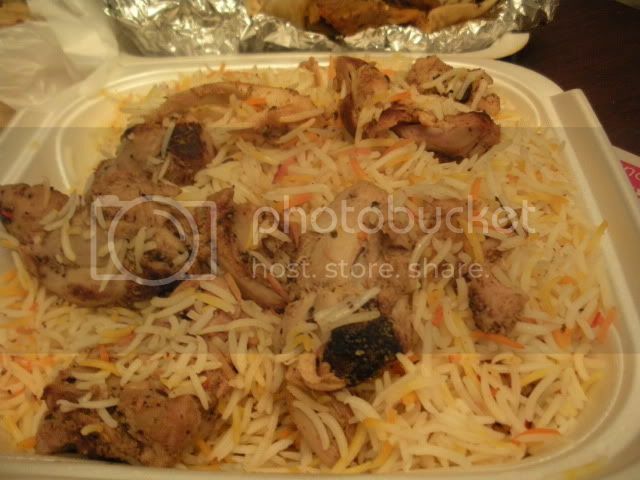 Kapsa (kabsa; an often-elaborate chicken and rice dish) is especially popular in Saudi Arabia and it seems Ghareeb Nawaz makes a nontraditional version. I wonder if it's simply their roast chicken topped with channa masala, served on a mountain of rice. However it's made, it's a tasty dish and a steal at $4.50 (all prices are remarkably low but this might be one of the better deals). The rice is far more than a supporting starch. Fans of bitter melon should consider trying kerela masala (but, seriously, you need to be a true fan). I enjoyed the spicy sauce that hardly conceals the warty cucurbit's bite. Leftovers were even better after the flavors had time to meld. Note that neither rice nor bread is included. These dishes probably wouldn't be my recommendation for first-time diners at Ghareeb Nawaz but I'd order any of them again. They could be useful for those wanting to break out of an ordering rut. Rene G wrote: Over in Shopping & Cooking, Tatterdemalion introduced us to hunter beef, the Pakistani version of corned beef. 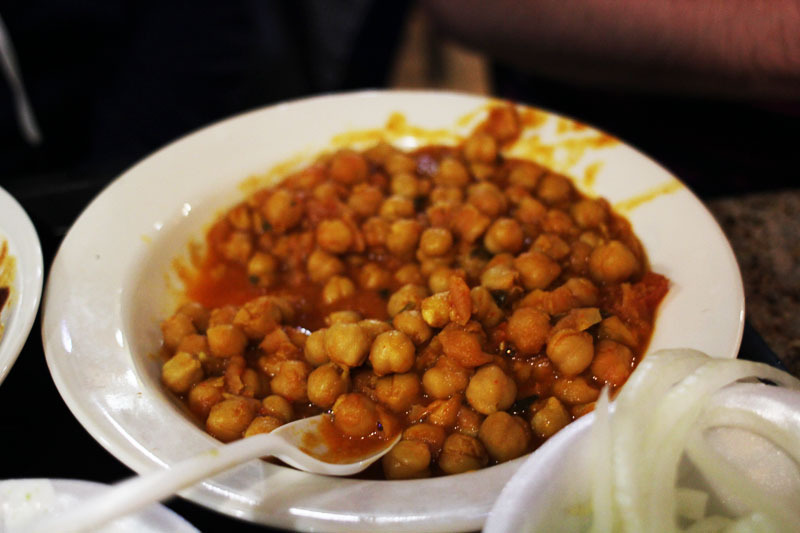 Thanks for turning us on to this great simple Subcontinent nosh, Nab (tatterdemalion). Describing hunter beef as Pakistani corned beef is dead on. I absolutely loved the spice profile of this dish at both places we tried it at (Hopefully, more posts to come). It's more complex, at least spice-wise, than any Western style corned beef I've ever had...and I do appreciate it for that as a welcome counterpoint. Rene G wrote: Fans of bitter melon should consider trying kerela masala (but, seriously, you need to be a true fan). I enjoyed the spicy sauce that hardly conceals the warty cucurbit's bite. Nuclear bitter melon is what this is! Loved it. If you guys like the hunter beef, you should try the chili gosht. It's basically a fiery version of the hunter beef. It's one of my favorites here. Yes, it is beef and not goat. laikom wrote: If you guys like the hunter beef, you should try the chili gosht. It's basically a fiery version of the hunter beef. It's one of my favorites here. Yes, it is beef and not goat. Of the three hunter beefs I tried on Devon recently, the version at Ghareeb Nawaz was the most plain. That's not to say it's bad. The other two places griddle the meat with onions and green chilies, making a more interesting paratha/sandwich filling. Thanks for the chili gosht recommendation. I returned to Ghareeb Nawaz to try it. The chili version is certainly tasty. The sauce adds some welcome heat and moisture though it does obscure the hunter-ness of the meat. I liked it but thought the sharp chili paste got a little tedious midway through (I ate the generous serving by myself). It would be a great accompaniment to other dishes, especially some of the less spicy ones. PIGMON wrote: Nuclear bitter melon is what this is! Loved it. 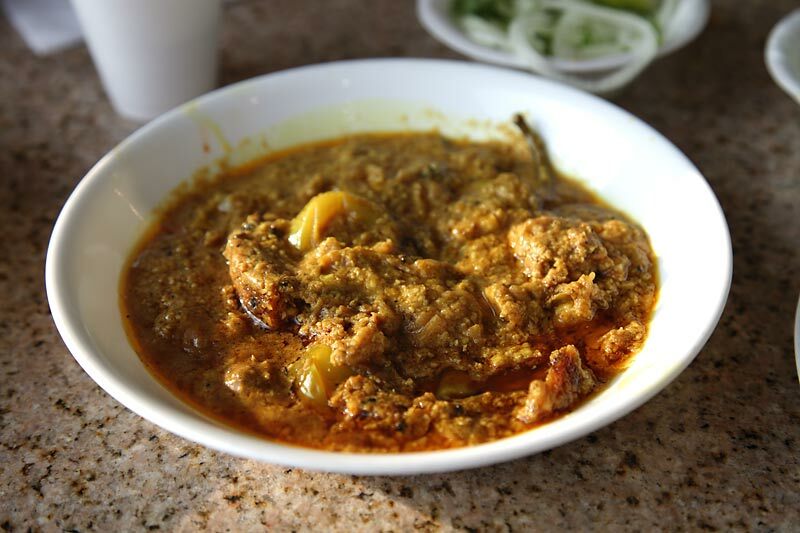 On the bitter gourd front, I noticed kerela gosht on the menu (I'm constantly discovering things long in plain sight). Diluting the bitterness with a little meat probably wouldn't be a bad thing. PIGMON may have loved the straight kerela but I couldn't help noticing he didn't eat a whole lot (though more than I managed) and refused the leftovers. It's a good dish, but another better shared with a group. 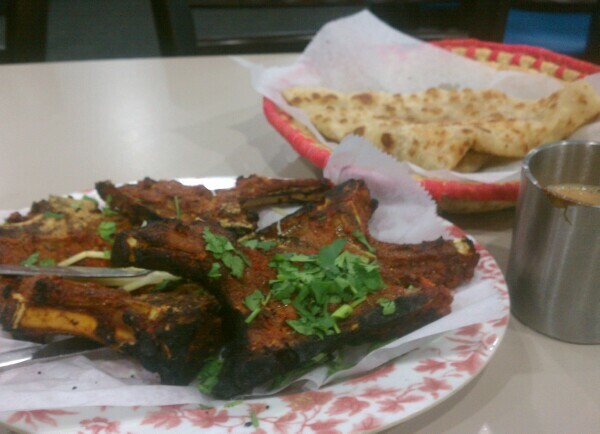 I could really go for some tandoori fish like the one at Khan BBQ, but I never tried Ghareeb Nawaz. There's a fish plate - "fish fillet marinated with spices and garlic" and fish curry - "cooked with different spices and onion, yogurt, garlic, ginger paste". Has anyone had either of these? Also - any word on the chapatis or tandoori chapatis? I wanted the fish plate, but the woman behind the counter insisted it was fried, despite the claim on the menu that it was grilled. So I went with the fish curry. I couldn't decide between the chapati and tandoori chapati, so I ordered both. All this set me back $5.48. It got even better when I returned back to the office. There must have been about half a pound of fish in there, and you can barely get half a pound of raw naked fish at the grocery store. The chapatis were big enough to swaddle an infant in. The curry was a bit oily, but I'm telling myself it's full of omega-3s and it's unequivocally healthy. A warning to all you fellow spice wusses out there: medium ain't. My face, she burns! The girl in the box next to me told me I'm flushed and hoped that it's not going to be that spicy...later. Ow. Yet, I had enough gravy and nearly all of a chapati left over, so I'm saving it for a snack tomorrow, so that didn't deter me. But lord help me, I'm out of yogurt. the maven wrote: Then I visited Delhi Darbar with a friend, and I was hooked. Been alternating late night, at least late for this old guy, between Delhi Darbar and Ghareeb Nawaz. Still very much in love with GN, but DD is a pleasant change of pace a little more comfortable, though slightly more expensive, but then again you can't get a gas station sandwich and soda for less than GN, and table service. Delhi Darbar on the plate is slightly erratic, then again so is GN, chicken biryani plump moist flavorful one night, dry a week later. Same with paratha, one night crisp slightly oily, in a good way, and delicious, week later limp oily, in a bad way, and almost inedible. 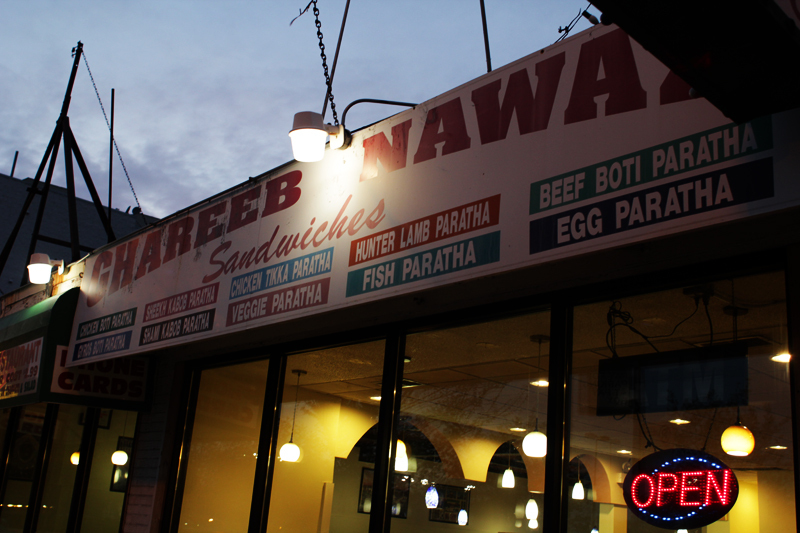 Ghareeb Nawaz Express opened on Tuesday, November 6 at 807 W Roosevelt Rd, former home of Pitabelly, next door to the new branch of Powell's Bookstore. I have a feeling they'll do well. 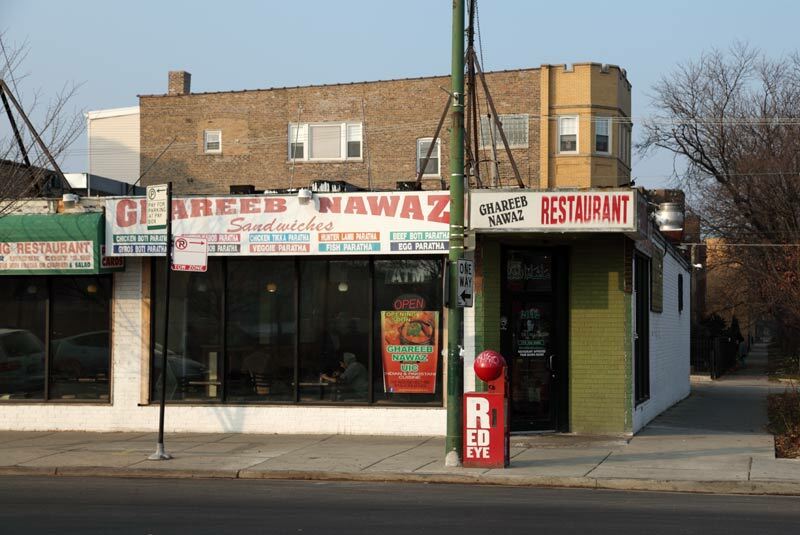 Rene G wrote: Ghareeb Nawaz Express opened on Tuesday, November 6 at 807 W Roosevelt Rd, former home of Pitabelly, next door to the new branch of Powell's Bookstore. I have a feeling they'll do well. Excellent news! Can't wait to check them out. 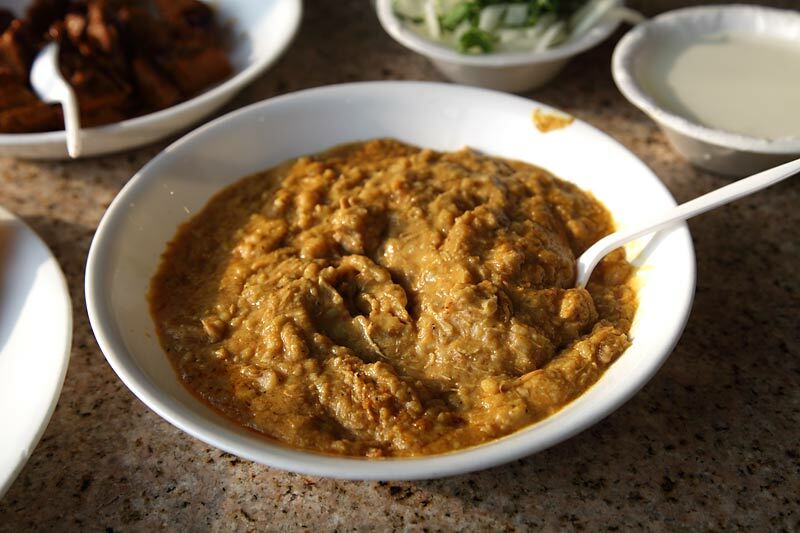 Starting tomorrow (Friday 11/8/12), Ghareeb Nawaz Express will be making both beef and chicken versions of haleem; unlike their Devon location which only makes the chicken version. 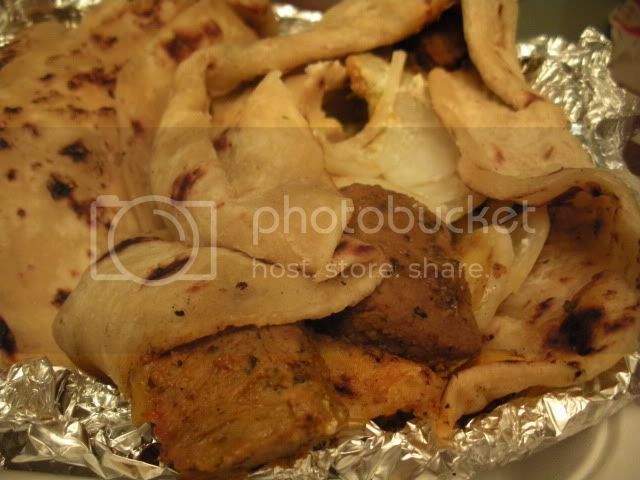 This is one of my go-to places when we don't feel like eating bbq (I know, sounds crazy...but eating Q all day everyday gets to be a bit much)...my Honduran army in the kitchen loves what they call "Indian Burritos" aka Chicken Boti (or Chili) Paratha. Plus, I'm always happy to treat everyone - where else can you get quality, fresh food for 10 people for $25? I have always been impressed at the freshness and quality of their meats, byrani, paratha, and LOVE their curried vegetables (veggies in a creamy curry sauce). Students at UIC will love this place! I really can't believe I've never posted on this thread before but I've been thinking for a while about a meal I had at Ghareeb Nawaz several weeks ago that was really wonderful, and I wanted to post some pics . . . Piping hot and lightly crispy on the outside, with a very satisfying chewiness. 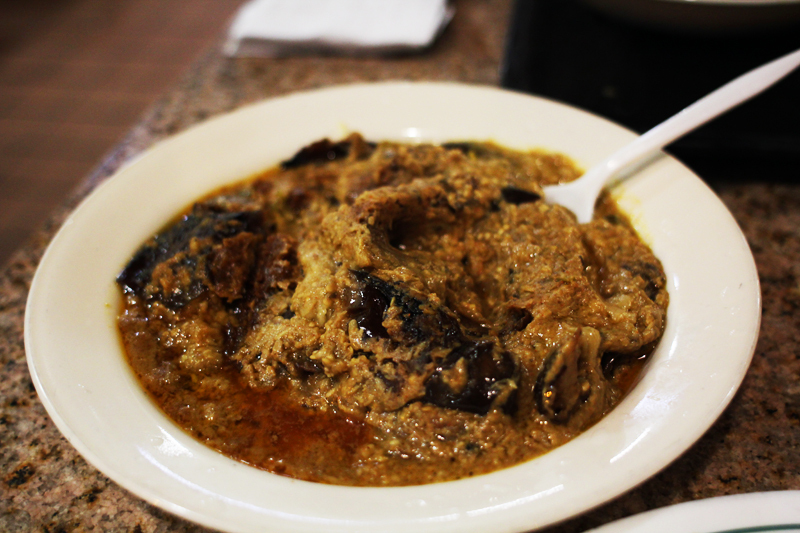 I'm not a huge fan of haleem but I liked this version a lot more than most. I was with Pigmon when he was doing research for his haleem piece in the Tribune, which is why we ordered this. Here, we just decided to go with what we thought was the craziest item on the menu. It tasted fine but the texture was a bit spongy and the temperature was a bit cool. Just a phenomenal dish. It's essentially a spicy, peanut-based chile curry that I first leaned about from REB. Sula also wrote about it a few months ago. 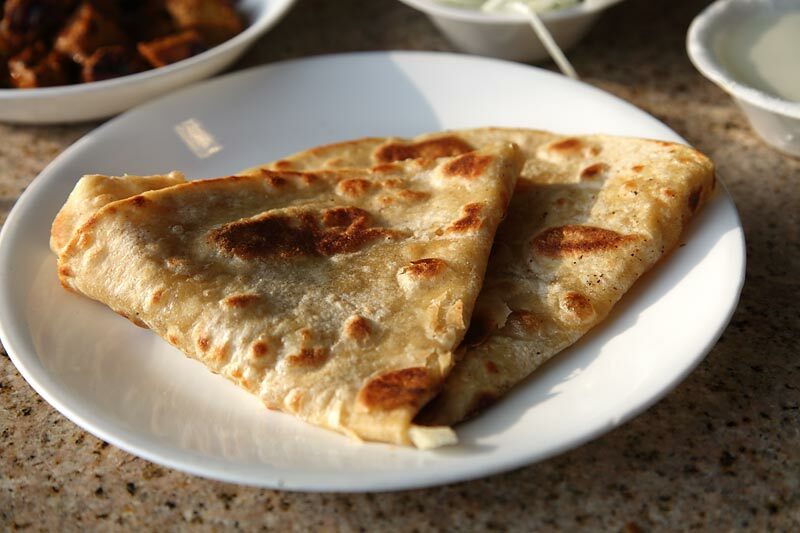 At this meal, my first time trying it, it came out at the end, and we ate it mostly by itself with the paratha, but I think it would be just as enjoyable eaten as a condiment of sorts on biryani or other dishes. I take this place for granted and I feel it doesn't get as much attention here as it deserves. The food's delicious, it's extremely inexpensive and it's open (just about) all the time. 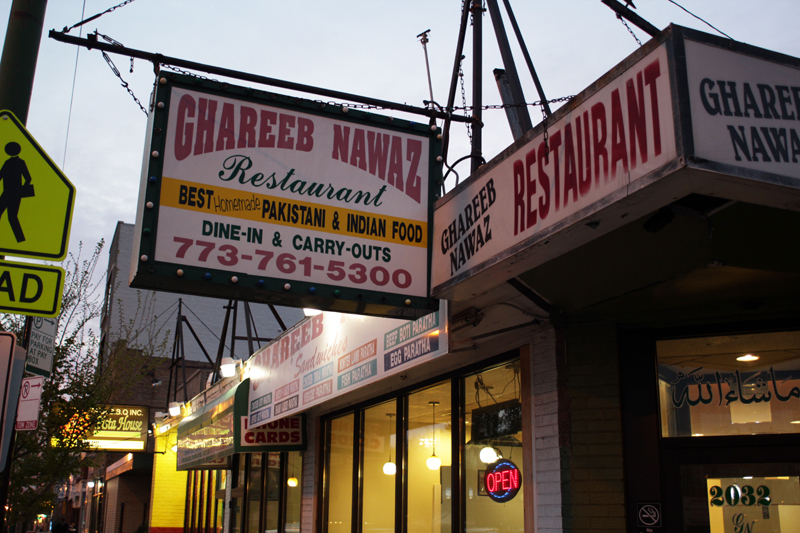 Ghareeb Nawaz is a great spot on Devon that should be spotlighted more often than it is.